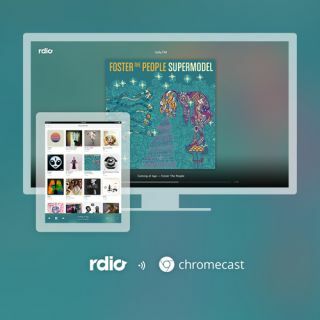 Rdio, Crackle and VUDU now available through Google Chromecast | What Hi-Fi? Rdio, Crackle and VUDU are the latest music- and video-streaming services to be made available through Google Chromecast, the HDMI dongle recently launched in the UK. The additions to the Chromecast line-up add to an already extensive service, including Netflix, Pandora and YouTube, while BBC iPlayer is also available on UK dongles. Rdio confirmed that users who own a Chromecast can now push songs, albums, radio stations and playlists to their TV, with a "beautiful display of album art" appearing on screen. Rdio CEO Anthony Bay said: "Rdio on Google Chromecast marks another milestone in Rdio’s commitment to delivering the best music experience everywhere." You can also find Crackle listed in the Chromecast app store. The service is subscription-free and offers a handpicked selection of Hollywood movies and TV programmes. And although VUDU does not appear in the app store, the company has confirmed that you can access its library of movies and TV programmes through Google Chromecast on your home set. To access VUDU, you can use the Chrome browser on a PC or Mac with the Google Cast extension, or the latest VUDU Player app for iOS and Android mobile devices. Google Chromecast plugs directly into an HDMI port on your HD TV and lets you stream content by connecting to your home wi-fi network – and is available for £30 from all major retailers.